This is countdown week. We are working on many small remaining items, from revising web pages, to shooting training videos, to making final changes in the product itself. Next week, the week of April 10th, we’ll be launching the Windows version of Song Surgeon Version 5. The Mac version should be available about a month thereafter. Version 5 has some very valuable new features. These include chord detection, key determination, and tempo detection. The accuracy of these is comparable to best of those on the market today. Moreover, I am not aware of any other slow downer that has all three of these features in one product. Version 5 has been totally redesigned and includes the ability to customize many of the features and settings. There is a long list of additional new and enhanced features, including the ability to create a 4 beat click track, overdubbing, a detailed editing module, L/R channel volume control, a larger number of algorithm settings including some non-real time ones that will provide even HIGHER quality audio that you currently get – and of course that is just the beginning. If you haven’t yet entered our drawing to win a free copy of Version 5, there is one more week remaining. In the next section of the newsletter you will find the announcement and link for this contest. Compared the lottery these are great odds, and there is no cost to sign up. 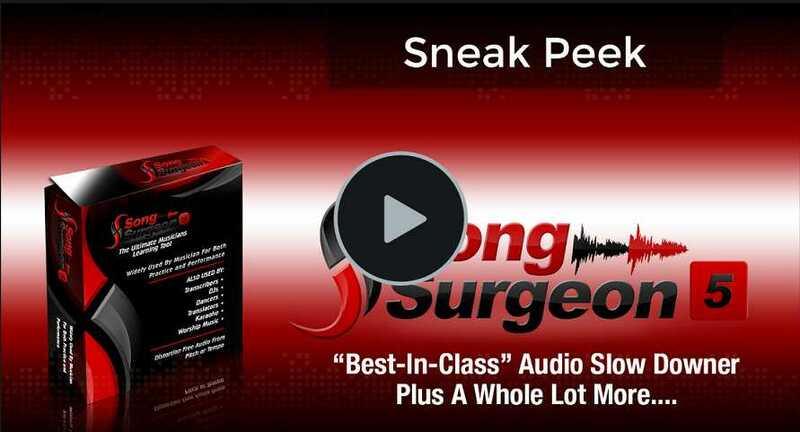 Would you like to win a free copy of Song Surgeon Version 5? If so, enter our drawing by completing the form on this page. We’ll be giving away 1 free copy for every 200 registrants. Compared to playing the lottery, these are terrific odds. Stay tuned to our newsletter to see if you’ve won. We’ll announce the winners on launch day. When we begin selling Version 5, if you are a Song Surgeon customer (even if you purchased Upgrade Protection and are entitled to a free copy) you will need to log in by ticking the box in the image below, which will appear on the order page. When you do, our system will look up your purchase record and apply your discount. 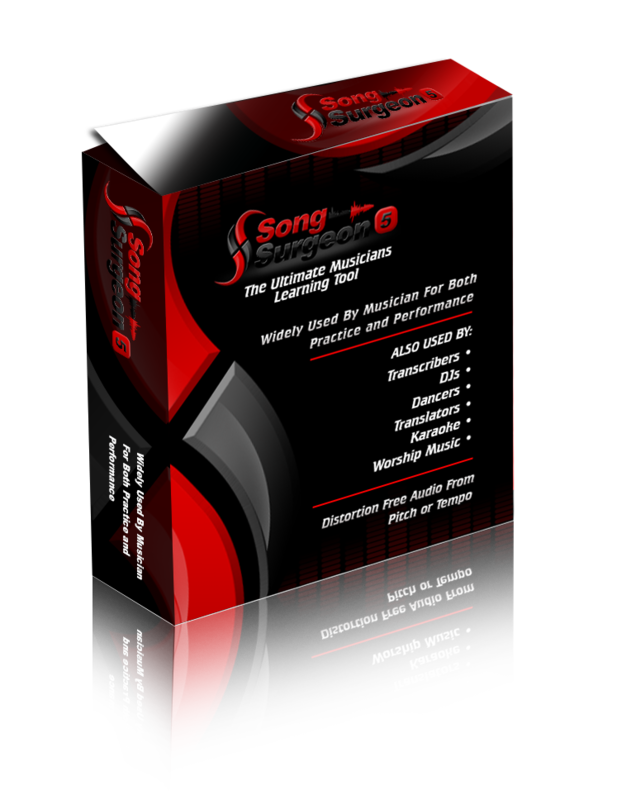 Discounts are available for all previous purchasers of Song Surgeon. Discounts are not available if you own one of our other products, but not Song Surgeon. If you are considering a purchase of Song Surgeon, please note that the above Upgrade Policy allows you to apply the money you might spend on Version 4 now, to Version 5 on a sliding scale basis. For example, if we release Version 5 in early April you will be able to apply 100% of today’s purchase price against Version 5. That’s a pretty sweet deal — so if you need key/tempo change now, there is no need to wait for Version 5 in a couple of weeks. Over the past months we have shown you a number of the new features that will be found in Version 5 and there are many, many more. I’d like to refer you to a couple of new pages for more details. Once of these is an overview of the the more significant changes in Version 5. Next week we will be sending an email to you as we launch the product. Be on the look out for this. And, if for some reason you don’t receive it, just go to our website. You will find a new home page and from there you will be able to navigate the site to learn more about the features, download a demo version, or order the product. p.s. Here is the first feedback we have from some of our beta testers.